The College of Fine Arts is pleased to announce that all of our units have been officially certified as Green Offices by Florida State University’s Office of Sustainability, making CFA the first completely certified college in the University. The certification was completed by leadership and staff in each of our eleven academic and non-academic units. Each department analyzed their operations to ensure that their procedures and practices are aligned with sustainable practices, and learned about new ways to incorporate “green practices” into the everyday work environment. 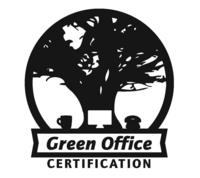 In order to be certified, offices are asked to adopt multiple initiatives in three primary categories: energy conservation, waste reduction, and recycling. Offices are also expected to consider and implement sustainable practices relating to purchasing, travel, special events, and information technology. Because our units are already focused on efficiency, staff found that many best practices were already a part of the way we do business. Achieving certification was a great way to recognize the ways the College of Fine Arts already prioritizes resource conservation and cost savings. Thanks to each office for their commitment to sustainability, and congratulations on achieving certification!